Festival funded by Roy E. Disney, director emeritus of The Walt Disney Co.
Students in the School of Film and Animation at Rochester Institute of Technology took top honors at the 2D or Not 2D Animation Festival, an international animation festival held in Everett, Wash.
RIT student animators competed against students from such universities as New York University, The School of Visual Arts, Vancouver Institute of Media Arts, Savannah College of Art and Design, and the Hamburg Institute in Germany. 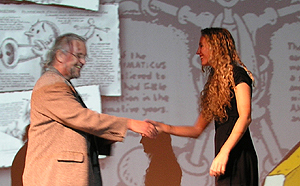 Golden Pencil Awards, given to the winners in each category, were presented to RIT seniors Joseph Daniels and Jedidiah Mitchell in the category of Best Student Film for Way of the Mantis and RIT alumna Brittney Lee for Best Animation in a Student Film for The Musical Genius of Mozart McFiddle. Merit Awards, presented to the runners-up, were given to graduate student Adam Fisher for The Ballad of the Purple Clam and senior Wesley Storhoff for The Infinite Monkey Theorem. Nancy Beiman, professor in RIT’s School of Film and Animation, also received a Golden Pencil Award for her special presentation at the festival and for her role as senior project advisor. The festival, held Nov. 17-19, featured Roy E. Disney as the festival’s keynote speaker. Roy E. Disney is the son of Roy O. Disney and nephew of Walt Disney, co-founders of Walt Disney Co. Disney also received the Roy E. Disney award for his contribution and advancement of the art of animation. This is the first year for the 2D or Not 2D Animation Festival, hosted by the Animaticus Foundation, an organization committed to the education and advancement of traditional, hand-drawn animation. At the festival, foundation president Tony White, known for his animation work on many independent and commercial films including Hokusai, Cathedral and Endangered Species, explained that the Animaticus Foundation aspires to provide opportunities for 2D animation students to study in an academic environment, as well as work as apprentices to master animators on ‘real’ ground-breaking productions.